Minister of Environment, Amina Mohammed, who has been one of the major influencers of Sustainable Development Goals (SDGs) launched late last year in New Yok has reiterated her stance on SDGs once again at the inaugural town hall meeting tagged ‘Buharimeter’in Abuja yesterday. Amina posited that the role environment plays in actualising each of these Global Goals (SDGs) cannot be overemphasised hence it’s important that all Nigerian citizens get involved in its implementations so as to accelerate and maximise its impacts on our nation’s overall economic growth. ‘We cannot leave everything for the government to do, Yes, Ministers are public servants and it is a privileged to be one, but things would only work perfectly if we can earn your cooperation and work together in achieving all these goals. She stated that this administration would ensure that its delivers on all its promises at addressing security issues, ensuring steady infrastructural development and revamping the economy. The Minister, who had earlier visited the lead poisoning affected communities in Niger State like Shikira, mentioned that the emergency response to remediation of these communities would commence as soon as the fund for the remediation is approved by the Federal Government. “In collaboration with Ministry of Solid Minerals, we will commence the remediation of these affected communities in Niger State’ she alluded. 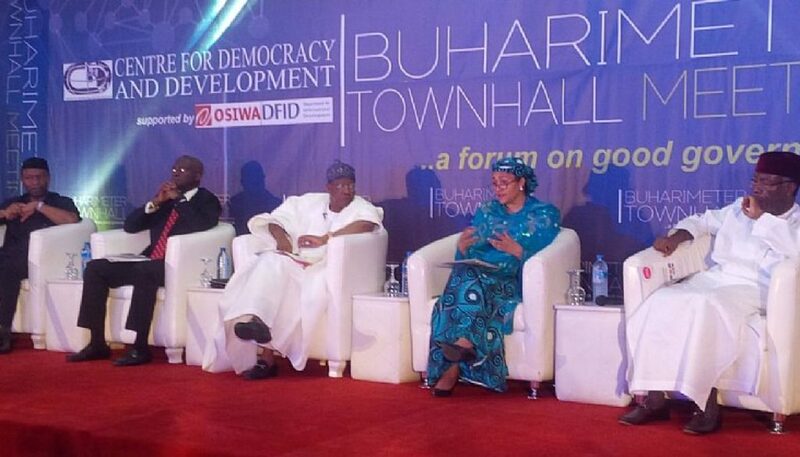 The Buharimeter Townhall Meeting was organised by Centre For Democracy and Development (CDD) aimed at assessing the one year in office of President Muhammadu Buhari and his All Progressives Congress (APC) government. The event had five federal Ministers in attendance namely: Lai Mohammed (Information and Culture), Babatunde Fashola (Power, Works, and Housing), Audu Ogbeh (Agriculture and Rural Development), Amina Mohammed (Environment), and Udo Udoma (Budget and National Planning).